Gold Coast Leadership Group: DT Relevance? 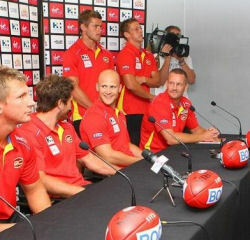 The Gold Coast leadership group was announced today with Gary Ablett named as the Captain of the club. This is no surprise, but who are the other members of the leadership group… and what might that mean for Dream Team in 2011? Being Captain of a team is nothing new for Gary Ablett. He was selected as a captain 180,283* times last year in Dream Team and this year, he will lead the Gold Coast Suns. Nathan Bock will be his vice and deputy vice will be Campbell Brown. But if we look more into this announcement, we see who else is in the leadership group. Surely they won’t be putting anyone in there who won’t be getting games? Huh?! Zac Smith (RUCK), Maverick Wellar (MID) Daniel Harris (MID) and last years captain Marc Lock (MID) will be basically rookie priced and surely now guaranteed games – at least early on! Not a bad thing to keep in mind when selecting your team… especially as we won’t get a “Round 1” team for the Suns with them having the bye first up. * completely made up statistic. VFL experience vs TAC =$20,000!!!! Monty did say might not be as much- his conservative approach! Makes sense & seems fair, as GC will have the most rookies. Marc Lock = great name for DT. MIDFEILD / FORWARD SORRY OR IS HE ONLY MIDFEILD?? weller is a gun get on him! will lock be worth looking at, dont know what type of player he is? Just signed up and allready looking forward to the season. Hopefully it’ll be easier to play from Australia. Anyone with the name Maverick deserves a spot regardless! Ranked no. 1 for disposals for QLD in the 2009 Under-18s. Ranked second most ‘outside’ player for Gold Coast in 2010 (77% of possessions uncontested). Sounds like a potential DT whore. Thanks Virgil. I’m overseas atm and can’t wait to come home in 2 weeks to buy the prospectus. I’m going for a league win. I’m prepared to play with < 6 mids in round 1, which may cost me 1 win, because I’m going to stack my midfield with GC rookies – Swallow, Harris, Bennell, Weller and Lock (at least). All are shoe-ins for early games (injuries permitting). At $106k, the latter 2 just need to average around 50 to increase $100k. The former 3 should average way more. Easy money and I can stack my forwards with premiums to make up for the initial lack of midfield firepower. Zac Smith LOCKED AND LOADED! so is David Swallow. Marc Lock……. ?